COLUMBIA, S.C. – Jalen Harris scored a career-high 17 points and the game was tied, 63-63, before South Carolina pulled away late for a 77-65 victory over Arkansas Saturday afternoon at Colonial Life Arena. The loss snapped a four-game SEC winning streak by the Razorbacks. Arkansas forced 21 turnovers, one off South Carolina’s season high of 22, to mark the fourth time in the last six games the Razorbacks have forced at least 20 turnovers. 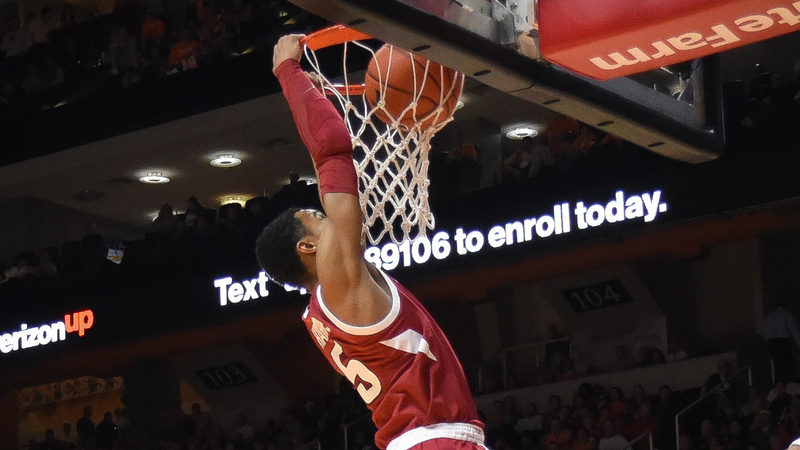 Arkansas also had 10 first-half steals and 13 for the game, one off its season high. All five starters had at least two steals with Adrio Bailey leading the way with three. However, the Gamecocks were able to get the win as they made 16 of their last 22 shots and sank 10-of-15 3-pointers for the game. The Razorbacks were 6-of-22 from beyond the arc. Two of those six 3-pointers by Arkansas came early in the game. Mason Jones made back-to-back treys, the first of which came at the 18:43 mark. That triple marked the 1,000th straight game the Razorbacks have made at least one 3-pointer, which ties for the fourth-best streak in the NCAA. A.J. Lawson led South Carolina with 24 points, making 4-of-5 3-point attempts. Keyshawn Bryant added 17 points and Chris Silva had 16. Hassani Gravett was 3-of-4 from 3-point range. Harris was able to score a career-high 17 as he was 7-of-10 from the free throw line. Jones had 15 points and four assists while Isaiah Joe scored 11. Arkansas will play at Missouri on Tuesday (Feb. 12). Tip-off is set for 8 pm and the game will be on ESPNU. The game will end a nine-game span that featured six road games by the Razorbacks. South Carolina scored the first two points, on free throws by Chris Silva, but Mason Jones hit two 3-pointers and Daniel Gafford had a dunk for an 8-0 run. Overall, Arkansas went on a 12-2 run to give the Razorbacks a 12-4 lead to start the game. Arkansas did not relinquish the lead in the first half. Five of South Carolina’s first seven points of the game came at the free throw line (5-of-10). Arkansas had 10 first-half steals. It is the seventh time this year the Razorbacks have reached double-figures in steals in a game. Arkansas took its largest lead of the half – 12 points (26-14) at 7:47 – after am Isaiah Joe 3-pointer and Jalen Harris free throw. The Razorbacks also led by 11 (30-19) at 4:18. Jalen Harris and Mason Jones each had eight points at the break to lead the Razorbacks. SECOND HALF: Arkansas was held scoreless over the final 3:11. Isaiah Joe opened the second half with a 3-pointer for a seven-point lead. The Razorbacks used a 10-1 run leading up to the first media time out to go up 13 (50-37 at 15:09). Daniel Gafford and Adrio Bailey had back-to-back dunks to cap the run. South Carolina answered with a 12-0 run to cut its deficit to one, 50-49 at 11:43. Mason Jones stopped the Gamecock run by making two free throws. However, USC kept the momentum and led by five (59-54) as part of an overall 22-4 run. The Razorbacks did not score over the final 3:11 of the game. Arkansas’ starters were Isaiah Joe (G) – Jalen Harris (G) – Mason Jones (G) – Adrio Bailey (F) – Daniel Gafford (F). This has been Arkansas’ starting lineup in 21 of its 23 games. South Carolina controlled the tip. USC’s Chris Silva scored the first points of the game, two free throws at 19:46. Mason Jones scored Arkansas’ first points, a 3-pointer at 18:43. This was the 34th meeting between Arkansas and South Carolina. The Razorbacks own a 20-14 advantage in the all-time series. South Carolina snapped a three-game losing streak to the Razorbacks. Mason Jones made a 3-pointer at 18:43 to mark the 1,000th-straight game Arkansas has made at least one triple. Arkansas ranks fourth-tied on the NCAA active list of teams that have made at least one 3-points. UNLV (1,067) and Vanderbilt (1,053) have made a 3-pointer in every game since the NCAA adopted the rule (as has Princeton, but the Tigers have only played 925 games). Duke (1,043) is third on the active list, followed by Western Kentucky, which made its 1,000th trey this past Thursday. Kentucky is the only other team to make a 3-pointer in over 1,000 games. However, the Wildcats’ streak ended last March at 1,047 games. Isaiah Joe made three 3-pointers to give him 82 for the season. He only needs to make two more to treys to set the Arkansas record by a freshman. Joe leads the SEC in 3-pointers made and is on pace the set the Arkansas season record for 3-pointers made. Arkansas took three charges at South Carolina, two by Isaiah Joe and one by Gabe Osabuohien. The two are now tied for the team lead, each taking 19. The Razorbacks have taken 30 charges over the last 11 games – 13 over the last three.